U.S. Sen. Ted Cruz is preparing Texas Republicans for a turbulent election year amid super-charged Democratic enthusiasm — including in his own re-election campaign. NEW BRAUNFELS — U.S. Sen. Ted Cruz is preparing Texas Republicans for a turbulent election year amid super-charged Democratic enthusiasm — including in his own re-election campaign. Traveling the state for GOP events this weekend, Cruz portrayed an uncertain midterm environment that could go down as disastrous for Republicans if they don't work to counteract Democratic energy throughout the country. Cruz has spent previous election cycles airing similar warnings against GOP complacency in ruby-red Texas, but this time it hits much closer to home for him — he is facing a well-funded re-election challenge from U.S. Rep. Beto O'Rourke, D-El Paso. 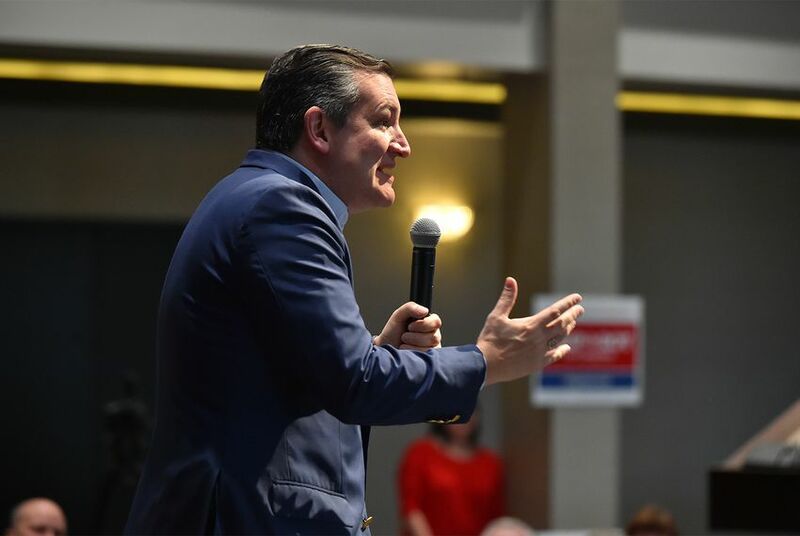 Addressing the Fort Bend County GOP on Friday night, Cruz warned of an "incredible volatility in politics right now," calling Democrats "stark-raving nuts" in their opposition to Trump. He pointed to Trump's recent State of the Union address and Democrats' reluctance to applaud, saying the scene "underscores the political risk in November." "Let me tell you right now: The left is going to show up," Cruz said, delivering the keynote address at the party's Lincoln Reagan Dinner. "They will crawl over broken glass in November to vote." Cruz is feeling the heat in his own bid for a second term. O'Rourke, who has sworn off money from political action committees, outraised Cruz in the last three months of 2017, $2.4 million to $1.9 million. It was the second quarter in which O'Rourke's haul was bigger than that of Cruz, who still maintains a healthy cash-on-hand advantage. Speaking with reporters here Saturday afternoon, Cruz said he was "absolutely" prepared for his re-election campaign but also acknowledged O'Rourke's fundraising prowess. "It’s true my Democratic opponent is raising a lot of money," Cruz said. "We’re not going to take it for granted. That’s a manifestation of the energy on the extreme left." Cruz spoke with reporters after headlining a rally for his former chief of staff, Chip Roy, who is running to replace retiring U.S. Rep. Lamar Smith, R-San Antonio. Roy — one of 18 GOP candidates in that race — started off his remarks at the rally not by discussing his congressional bid but by issuing his own warning about the Democratic push to flip red seats this year, saying it's "real — it's a real effort." "I want to talk about my election in just a minute — but we've got to send Sen. Cruz back with a mandate," Roy said. "There's nothing more than the left and frankly the establishment — on both side of the aisle in Washington, D.C. — would like more than to try to bloody up Sen. Cruz after what he has done over the last six years."